Okay okay... I know your Facebook feed is full of first day of school pictures and you're dreaming of a new Lisa Frank Trapper Keeper, but Fall's not here yet. Especially in the produce aisle. So put off that damn Pumpkin Spice Latte for a few more weeks and enjoy the freshness while you still can. When fruit is this good, take it beyond breakfast and try a savory preparation. I love sweet stone fruits in cool dishes this time of year and the flavors of Mexican cuisine lend themselves really well to using fruits. I whipped up these nectarine tacos in under 20 minutes on a weeknight. Fresh, spicy, sweet and crisp. Pumpkins and boots are coming, but live in the moment why don't you? The nectarines will thank you. 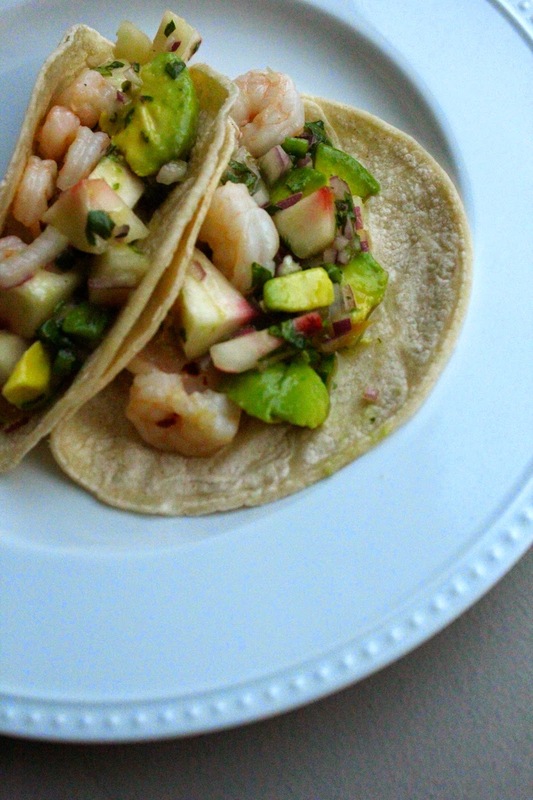 Toss together shrimp with avocado, nectarines, jalapeno, red onion, cilantro, lime juice, chutney and salt. Serve in warm tortillas and enjoy.